Ocean City, Maryland – (January 16, 2019): The Ocean City Fire Department (OCFD) recently received a generous grant from the Ocean City Paramedic Foundation amounting to $99,000. 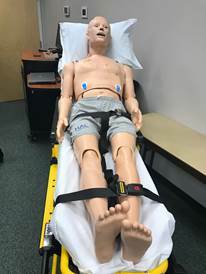 The contribution was used to buy two training devices, including the Gaumard Scientific Advanced Patient Simulators (HAL), which allows the department to provide realistic simulation training. The foundation’s grant contributed $36,000 toward the purchase of HAL, which had a purchase price of $76,000. In addition, the contribution by the foundation enabled the department to purchase a mechanical chest compression system. The device, LUCAS III, is a user-friendly piece of equipment that can be used on adult cardiac arrest patients. The foundation purchased three of these devices at a cost of $33,000. 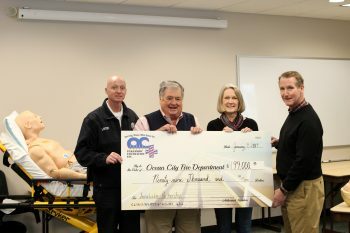 The remainder of the grant will be used for personnel training, including the EMS Today Conference, the Fire Department Training Network, and an Advanced Airway Anatomy course. “The Paramedic Foundation’s donation not only gives us state of the art equipment to train with, but it allows us to attend national training courses to assure we’re the most prepared to do our jobs,” Peterson finished.